The Ellery Queen TV show was a 60 minute crime drama series on NBC about a mystery writer who helped his father who was a detective with the New York Police Department, to solve murders. This was not the typical police action series. Ellery Queen used his brains rather than brawn to solve the crimes. 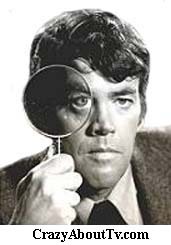 One unique aspect of the show was that immediately before Jim Hutton (Ellery Queen) revealed the identity of the murderer, he would face the camera and ask the audience if they had figured out who had commited the crime. Thirty-six years before the Ellery Queen TV show went on the air, there was an Adventures of Ellery Queen Radio Show that lasted for eight seasons! Thank you for visiting our Ellery Queen TV show page!